Nearing the top of the Eagle. Photo by Phil Brown. 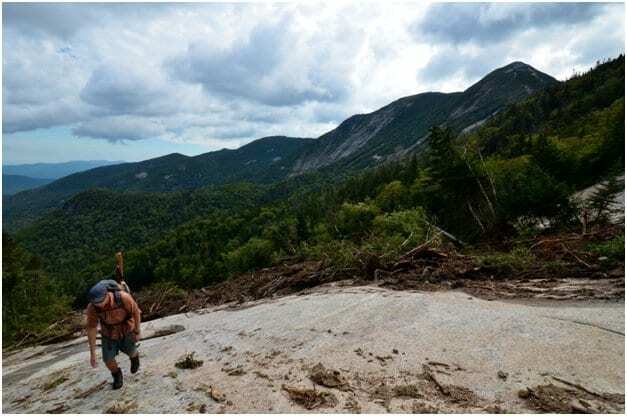 In the Adirondacks, we don’t have much terrain above tree line, but for those hikers who want to experience a little exposure, we do have slides. These are formed when a rainstorm saturates the thin soil on a steep slope and washes away the vegetation, creating a scar of bedrock and a natural pathway to a summit. 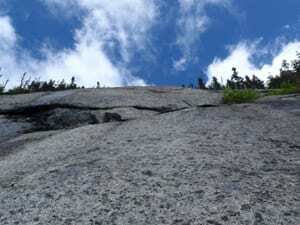 Perhaps the best slide climb in the Adirondacks is the Eagle on the west cirque of Giant Mountain. It’s the only slide given five stars (the highest rating) in Adirondack Rock: A Rock Climber’s Guide. 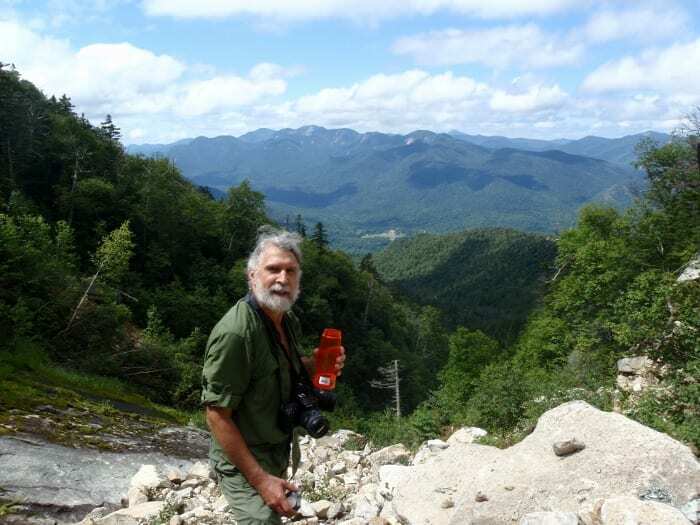 The book calls it “a great introduction to East Coast mountaineering.” It’s 1,300 feet and rated fourth class. I climbed the Eagle yesterday (6.25.09) for the third time. The first time I wore hiking boots and picked my way up by the easiest routes possible. The other two times I wore rock-climbing shoes, which made the ascent much more enjoyable. I was able to scramble straight up the rock without much fear of slipping. So if you’re thinking of doing the Eagle, don’t undertake the trip lightly. 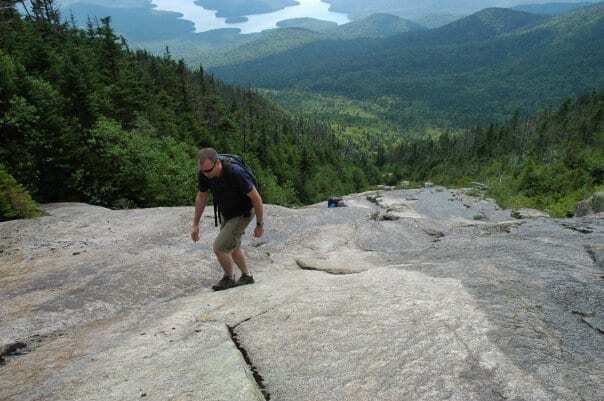 It’s much steeper than most slides in the Adirondacks, such as those on Whiteface, Dix, and Nippletop. I did the trip solo yesterday. I’m embarrassed to say it took me nine hours. I was on the Roaring Brook hiking trail for the first mile or so. I then began a long bushwhack up the brook, which took me more than three hours. I later discovered that I could have saved a lot of time by continuing on the hiking trail and picking up a herd path that leads to the brook. I’m not sure when this herd path was established. I didn’t notice it on my earlier trips several years ago. When I got to the base of the Eagle, I changed into my rock shoes. With these on, I felt confident going more or less straight up the face. The rock doesn’t have an abundance of cracks, but it has plenty of pockmarks and tiny ridges and bulges for grip. I spent about an hour on the face. This includes stops for lunch, photos, admiring the views, and changing into and out of my climbing shoes. 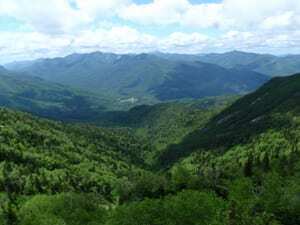 As you ascend, you can see most of the High Peaks–all unbroken wilderness–as well as parts of Lake Champlain and Vermont. The golf course of the Ausable Club is conspicuous in the valley below. At the top, the slide narrows into a slot between the trees. This takes you to a boulder with a flat top, a good place for changing shoes or taking in the scenery. From here it’s less than a minute to the hiking trail. Turn left, and you’ll be at Giant’s summit ledges in maybe two more minutes. The descent by the trail is only 3.6 miles, but it took me two and a half hours. It’s steep and often rocky or muddy, so it’s hard to make good time on this route. On this day, I was further slowed by tight-fitting boots that jammed my toes going downhill. I’d wager that fit and experienced climbers who shorten the bushwhack by taking the herd path could do the Eagle in five to seven hours, depending on how much of a hurry they’re in. But even if it takes nine hours, it’s worth it. Your blog is quite an inspiration. I know you confess to being middle-aged, but would you be willing to reveal exactly how old you are? Hoping you’re much younger than me so I don’t feel compelled to best your best. Jay, it’s hard for a journalist to withhold vital information. I turned 55 in March. Ouch. I’m 61, and have climbed the Giant slides 15-20 times over the last 25 years–with friends, family, my sons at various ages, and alone. The solitude and wildness is spectacular, and many times I chose to come here yet again, instead of exploring a new area of the Adirondacks. We always enjoyed following the brook up, and never met another person. I’m so sorry to hear about the herd trail; must mean the slides are getting popular. No doubt trash, turds, and defacement with hiking poles will soon follow, so–another plea for deaf ears: If you don’t know how to behave in the woods, or can’t do without metal tipped poles, please go somewhere else that’s already been trashed and marked up. I precisely wanted to thank you so much yet again. I am not sure the things that I might have carried out in the absence of the actual creative ideas contributed by you relating to such subject matter. It was before a real intimidating difficulty for me personally, but encountering this skilled form you managed the issue made me to weep over happiness. Extremely happier for the advice and then pray you find out what an amazing job you’re undertaking teaching the rest all through your site. Probably you have never encountered all of us.